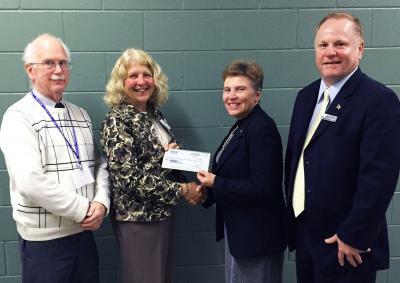 Mid Michigan Community College has received a $25,000 grant from the Consumers Energy Foundation in support of its new Morey Technical Education Center. The $3.4 million Technical Center, located on MMCC’s Mt. Pleasant campus, was made possible through community support and the generous contributions of local donors and charitable organizations. Through customized training solutions developed in conjunction with area manufacturers, the center exhibits MMCC’s ongoing commitment to meeting vital workforce demands. While there will be dedicated areas for welding and computer aided drafting, other areas in the center are open and meant to respond to these sorts of specific training requests. The facility will also house the Michigan Small Business Development Center – supported by the Small Business Administration and hosted by MMCC – that will continue to support entrepreneurs and help grow established businesses. The Consumers Energy Foundation is the philanthropic arm of Consumers Energy. It provides funding for a variety of areas including education, community, civic and cultural development, social services, the environment, and emerging issues. In January, the Morey Technical Center will offer its first welding and CAD classes, as well as a number of short-term trainings. For more information about The Morey Technical Education Center, visit www.midmich.edu.